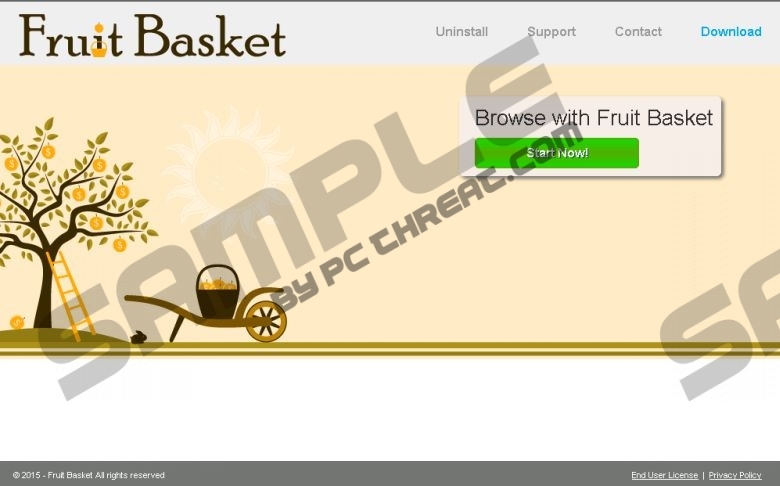 SuperWeb LLC just released a new adware application by the name of Fruit Basket. We have no idea who is in charge of naming SuperWeb’s programs, but we do know that that person should be sacked. It is also a good idea to remove the infection as the payload it carries might be rotten. Indeed, the content this adware promotes is known to be unsafe, so you should avoid installing this program. Nevertheless, if you have already been infected with Fruit Basket you should remove it either by using our manual removal guide or a malware scanner such as SpyHunter. We also recommend that you read this article, which contains a lot of useful information about what adware does does, where it comes from, and how much of a threat it is. SuperWeb has been very active recently as it has released, and we expect will continue to release, a lot of adware applications. The company has recently released adware applications called Metal Maker, Zoom Zoom, Wild West, Special Box, and so on, note that you should also remove any of the aforementioned infections. However, nothing has changed at camp SuperWeb as they continue to release their software based on the same old model so much so that Google Chrome is now immune to this infection. However, Internet Explorer and Firefox are still vulnerable to it. Fruit Basket has its own dedicated website called Fruitbasketsite.com, but you can’t download the infection from it as all of SuperWeb’s websites do not work. They are simply in place to promote the adware and feature ambiguous information about how this program is going to enhance your browsing experience. Nevertheless, you can pick up Fruit Basket by installing software bundles. These bundles are usually featured on freeware distribution websites such as Brothersoft.com, Soft32.com, and so on. Therefore, you should remove the program from the installation process by opting for advanced installation settings. As an adware application, Fruit Basket has been developed for the single purpose of displaying advertisements that come in the form of pop-ups, coupons, and so on. The ads are unreliable in nature as they are supplied by third parties. These mysterious third parties tend to be dishonest businesses, scammers, and cyber criminals all looking to make a quick buck. Cyber criminals could infect your computer with malware such as ransomware, and rogue applications. So, you should remove this app in order to keep your system safe. All in all, it appears that SuperWeb hasn’t outdone itself. It recently released a new adware which is essentially an age old infection with a facelift. Fruit Basket displays advertisements provided by third parties of unknown origin. The app is a serious theat because there is no way of knowing what might be lurking behind those unreliable third-party ads, for all we know they might be a source of infection. Therefore we encourage users to remove Fruit Basket as soon as possible. Find Fruit Basket and click Uninstall. Quick & tested solution for Fruit Basket removal.